Democratic government is growing and taking root all over Africa, but with this political change, older, time-honoured values are under threat. Traditional leaders - the kings and tribal chiefs - may have lost much of their power, but they remain an important, vital part of the societies they once ruled. Dried cow dung makes a surprisingly comfortable seat. Chief Kapika of the Himba people in northern Namibia was directing the milking of his cattle by waving his carved walking stick at his wives and sons and barking orders. Occasionally, he would direct his attention towards me. I was sitting on the ground beneath his chair seeking permission to film in the villages. Finally, a crinkled, warm smile lit up his eyes. "You are welcome," he said. His power reminded me of my childhood. I was about 11 years old and standing on a hill in the Transkei, and the rural Xhosa fishermen around me were excited. A cavalcade led by a shiny black Mercedes Benz appeared in a cloud of dust. The men removed their hats and knelt down in the long African grass as the cars roared past. I had just witnessed Paramount Chief Kaiser Daliwonga Matanzima inspecting his realm. Matanzima was a nephew of Nelson Mandela, who is also of Xhosa royal blood. Nelson Mandela led the struggle against apartheid and spent 27 years in prison before becoming the first president of a democratic South Africa. Matanzima co-operated with the white government and was made president of the Transkei, an apartheid-created homeland. 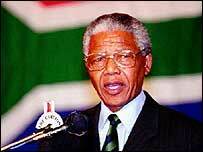 His power depended on his white rulers in Pretoria, and Mandela called him a "sell-out". But Matanzima's royal status meant that he was never completely ostracised. He remained controversial, rather than despised, and at his funeral in 2003 President Thabo Mbeki read a eulogy for him. The destinies of Nelson Mandela and Kaiser Matanzima illustrate the ongoing struggle between traditional authority and political modernity in Africa today. In Swaziland every year King Mswati III opens parliament with grand ceremony - a mix of African and British colonial rituals. A brass band plays while soldiers in scarlet coats stand to attention in the sweltering heat. The MPs are mostly dressed in loin cloths and traditional headdresses. They carry their wooden clubs called knobkerries through a hi-tech metal detector before entering the chamber. The king is also traditionally attired and arrives - in a black Mercedes limousine - and steps onto a red carpet while his security guards wear dark suits and sunglasses reminiscent of the US presidential secret service. 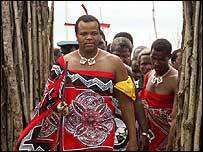 Swaziland is one of the world's few absolute monarchies. Opposition parties are not allowed in parliament, the press is state-controlled and criticism of the king is illegal. Poverty and unemployment are deep-rooted and political dissent simmers constantly under the surface. Still, when I spoke to a group of trade unionists who are the backbone of democratic reform, they saw the royalty as indispensable to their nation. "We love our king," one woman told me. "But we want a constitutional monarch, like in Britain." In colonial times, European powers across the continent tried to co-opt chiefs and kings to serve as their proxy administrators. The deep-seated power these - mostly men - wield is a reality even today. Another of my encounters with traditional power was with the Emir of Kano in northern Nigeria. It is like stepping into another era. At the gates of his palace men in colourful robes and turbans stand guard. Nearby, the dome of a mosque and a tall minaret float beneath a clear blue sky. You are ushered through a cool, darkened hallway into the 700-year-old "Chamber of the Elephant". The dome-shaped roof is supported by 20 arches, and the walls are covered in arabesques fashioned out of different-coloured mud. Trumpeters announce the arrival of the ruler on his decorated horse. Retainers rush to hold up a large cloth so that no-one may see him alight. The Emir proceeds to his court where his subjects kneel on the floor and bow down before him. A man in a flowing robe outlines his grievance against his neighbour. In democratic Nigeria, he retains the right of appeal to the state, but in smaller cases like his, it is often easier to accept the judgment of the Emir. The case is heard. 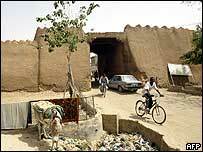 The Emir pronounces a fine of two goats and the court is closed for the day. It is not only in his court that the Emir holds sway. The respect given his ancient lineage is often needed in calming the sometimes violent clashes between the city's Christian and Muslim populations. Soon it was my turn to see the Emir. The bodyguards stood to one side. I was ushered into a quiet, shaded room filled with mud carvings and thick scarlet rugs on the floor. The Emir was sitting on his throne at the far end. He wore white robes and a turban edged with green. I asked him about his role in a changing Nigeria. And he listened courteously. "The West," he answered, "must understand that democracy is not only as they see it. We in Africa need time to work it out in our own way."